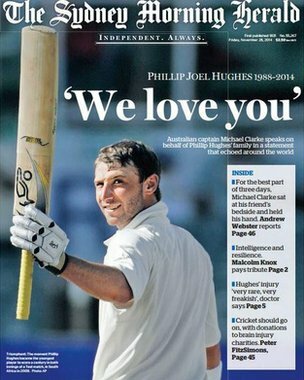 After the tragic death of Australian Phillip Hughes, the global cricket community has been in mourning. In fact it goes further than that, participants of many other sports have got involved in the put out your bats tributes. A well liked and respected young cricketer, with a bright future ahead of him, has been taken from us by a freak accident. No blame whatsover can be attached to the bowler Sean Abbott, for whom this must be harder to take than most. Cricket Australia have relesed a video tribute to Hughes, which I would recommend you take the time to watch if you can. 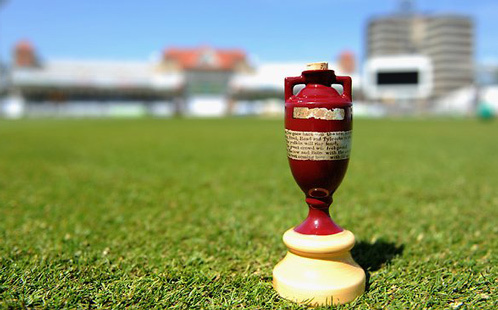 Like Michael Clarke's eulogy, it's moving stuff. In spite of the tragedy, I back Michael Vaughan's view that no changed should be made to the laws of the game as a result of this tragedy, just as the laws of football did not change after players such as Marc vivien Foe died on the pitch. Bouncers should not be outlawed. They are a part of the game. It was a rare medical condition that caused this incident to be fatal, and if we changed the laws based on the possible outcomes of all scenarios, taking into account all possible rare conditions, we would not have a game at all. I'm sure Hughes himself would not have wanted any changes to the game he loved. RIP Phillip, and bats out.